“You never get a second chance to make a first impression,” a fitting sentiment when it comes to the world of vacation property rental – making a great first impression isn’t just a good idea, it’s essential. Competition is fierce and it’s all about making your property stand out from the crowd. Is your Airbnb interior design up to scratch? If not it’s time to get to grips with a spot of Airbnb styling and Airbnb decorating – after all the best decorated Airbnb will be the one that attracts the most interest, and in turn, the most bookings. Guests are looking for more than just a place to rest their head, they are seeking an experience, and that’s why a well-planned Airbnb interior design is a must. Once you’ve got it, then it’s time to flaunt it! Showcase your vacation house design through high-quality photographs, and generate those all-important views. Ready to style your Airbnb rental like a pro and get more bookings? Then put these top tips into action – it’s time to improve your vacation rental house design. Understanding the needs of your target guests is key when crafting an interior design that’s likely to wow. Every traveler is unique, as are their needs – and each guest has his or her vision of the perfect Airbnb interior design. Intending to make your rental kid-friendly? Go for a neutral color base and then add a few pops of color to brighten the place up. Hosts often shy away from white furniture, opting for dark tones instead. However, designers recommend opting for items with light upholstery, as they can be cleaned by stain removing agents, whereas darker furniture is trickier to clean. Time to say goodbye to those musty old carpets in your Airbnb rental! They may be soft beneath your feet, but they also harbor dirt and germs. Even if regularly vacuumed carpets have a tendency to accumulate dust over the years. Why not trade your carpets in for high-quality wooden floors or porcelain tiles? 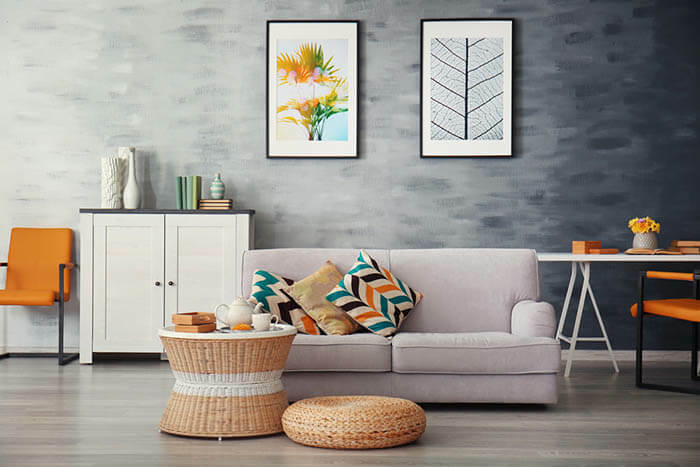 You will be surprised how cleaner, fresher and lighter your property will feel, and it’s a great way to instantly add style to your Airbnb interior design. If you like to be on-trend opt for dark or light tones, and avoid red and warm hues (these are less favored). Remember stylish doesn’t necessarily mean your Airbnb rental has to be stark. 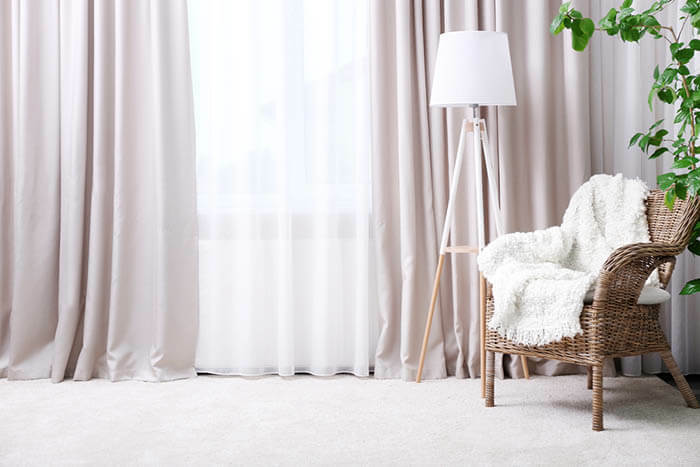 If you’re worried your place looks a little less inviting then simply throw down a few rugs, for a cozy, more inviting look. Go for an eclectic mix for your Airbnb interior design by using a variety of styles, textures, and patterns – this means your look will be far from boring! It may seem less daunting to stick to the one style and color palette, (especially when you are new to interior design). However, you need to be brave if you want your interior design to grab the attention of potential guests. The trick to stylishly eclectic Airbnb decorating? Decide on your main style and stick with that as you decorate 80% of the Airbnb space, for the other 20% mix it up and incorporate something different e.g. like the idea of modern style. Then furnish 80% of the space with contemporary furniture and add classic or boho-style items for the other 20%. Don’t be afraid to play with patterns, try out and use different designs – but keep them within the same color palette. Designers also suggest choosing patterns that have common elements as this will provide your Airbnb interior design with a cohesive look. Thinking about buying a furniture set for your Airbnb rental? 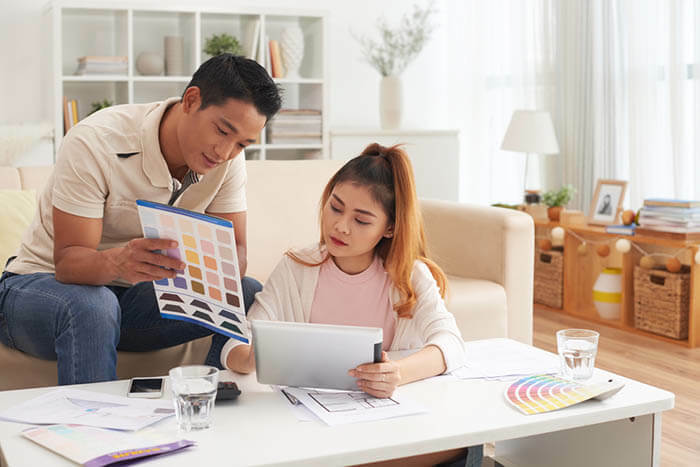 Don’t fall into the trap of investing in a matching furniture set – this is a trend that’s long gone in the interior design world. Tempting as it is to buy matching furniture from one brand (it’s generally easier and will save you time), the overall effect could look a bit naff, overly-planned and dated. If you want to take your Airbnb interior design to the next level and wow your guests with your good design taste, matching furniture sets are a no-go. Comfy casual is the aim of the game – opt for items of furniture from different brands and sources. The pieces should not look identical, but the look works best when they have something in common. Heavy, stylish curtains help create a comfortable and elegant atmosphere for your guests, whilst also adding warmth to your Airbnb interior design. Apart from improving the aesthetical appeal of your room, curtains have practical benefits too, such as protection against the sun and ensuring a quality night’s sleep for your guests. You can also hang sheer curtains, which add a sense of airiness to a room, allow light in, and manage to retain the feeling of privacy. If you have vertical blinds it could be time to take them down. Once upon a time, vertical blinds were a popular choice, but times move on and so do trends! Vertical blinds are now considered to be outdated by many, plus their practical value leaves much to be desired. People are feeling nostalgic and striving to be closer to nature in our technology-driven society. Therefore, house plants are on the list of Airbnb decorating trends this year. Designers often use house plants to liven up space, so why not give this trend a go and spruce up your Airbnb interior design with some wonderful house plants? There are some great low maintenance options, such as succulents – which are available in various shapes and shades of green. Ready to Style Your Airbnb Interior Like a Pro? You don’t have to be a style guru to create the best decorated Airbnb rental. When in pursuit of an eye-catching Airbnb interior design don’t forget about the two major principles: providing comfort and providing a homely feel. At the end of the day, guests like to feel cared for and prefer to stay in a place that feels like their home sweet home.